I’m always delighted when I get to shoot at a wedding venue that really takes my breath away. I vividly remember when I first saw that stunning double door barn as I made my way through the earthy stone out-buildings leading to the courtyard. The barn had all the rustic chic of the weddings we had shot in the vineyards and Chateaus of southern France except this was better because this beauty was right here in the UK! 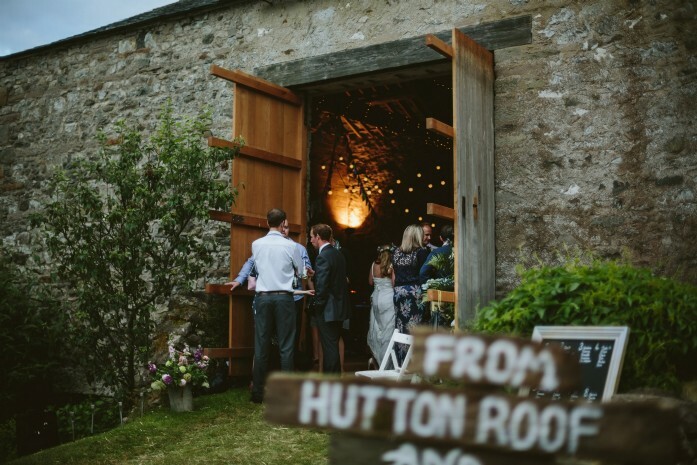 Having your reception at Figtree House means you can have that dreamy boho wedding without the worry of international travel, all framed by the beautiful Cumbrian hills – it really is a unique wedding venue! 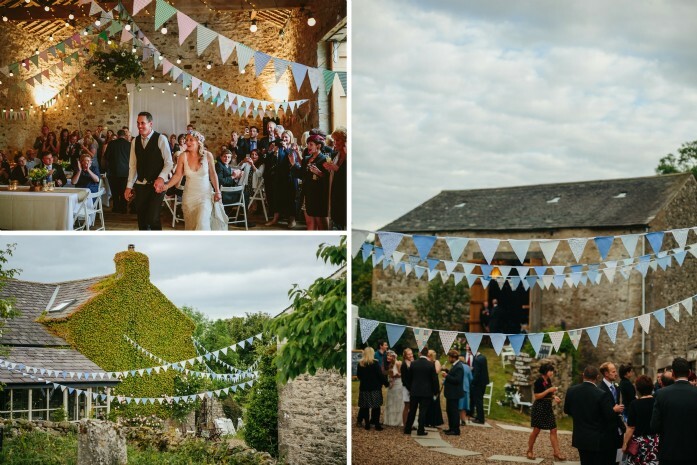 The barn’s grand double doors revealed the perfect backdrop to a fun and relaxed wedding reception with lovely high ceilings festooned with twinkly lights and decorated with bunting and delicate, white origami cranes – a thousand of them – for good luck and symbolising love and longevity. We at James & Lianne Wedding Photography were truly smitten with this venue and knew as soon as we arrived that this was going to be one of those standout weddings that we would be talking about for years – how right we were! Emma and Scotty were keen for a wedding that was easy on the formalities and as chilled out as possible. Figtree House lends itself to that. Even as Emma was getting ready, the obvious calming effect of Figtree House’s surroundings translated to a stress-free and breezy wedding morning. Emma and Scotty had a lovely blessing at St John’s Church in Hutton Roof, a short and picturesque drive away from Figtree House, with lots of scenic Cumbrian farmland as a backdrop. After the ceremony, Emma was keen to have her wedding portraits taken at the local saw mill and we were only too happy to oblige and embrace this unique setting, followed by a few romantic moments around Figtree House itself – there were so many wonderful places to take photographs and it made our job very easy! After the portrait shoot we returned to Figtree House to join the rest of their wedding party. We knew we were on to a winner by how much their guests were enjoying themselves. It was a real shoes off, summer dreaming affair with smiles and laughter all around. 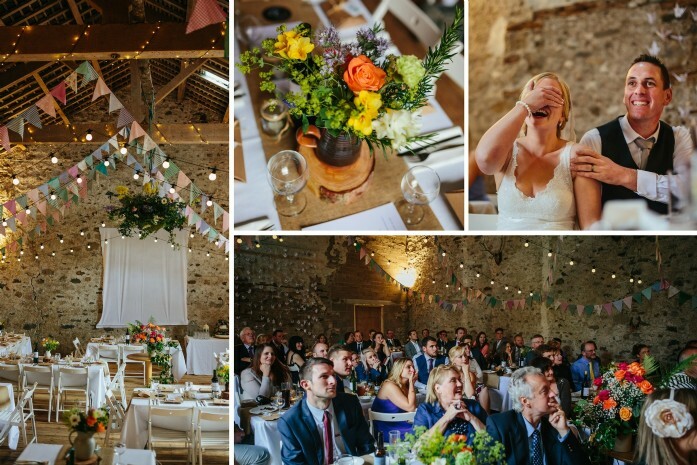 Everyone loved the barn and it was such an intimate setting for the meal and speeches. If you would like James and Lianne to capture your special day, please do visit their website to find out further information. Wedding photographers James and Lianne work as a dynamic duo capturing every aspect of unique wedding celebrations.